Henry Manigault Morris [1817-1892], New York; his widow, Georgia Edwards Morris [d. 1894], New York; her brother-in-law, Charles Manigault Morris [1820-1895], Baltimore; his widow, Clementina Morris, Baltimore; their son, Lewis Morris [b. 1867], Neponsit, New York; sold 26 May 1922 to (William Macbeth, New York); sold 4 December 1923 to (Art House, Inc., New York); Thomas B. Clarke [1848-1931], New York; his estate; sold as part of the Clarke collection on 29 January 1936, through (M. Knoedler & Co., New York), to The A.W. Mellon Educational and Charitable Trust, Pittsburgh; gift 1942 to NGA. According to Robert Bolton, A History of the Several Towns, Manors, and Patents of the County of Westchester from its first Settlement to the Present Time, 2 vols., New York, 1881, 484, this portrait and that of the sitter's wife Mary Walton Morris [NGA 1942.8.40] were inherited with other family portraits at "Morrisania," the Morris manor house in Westchester County, New York. Previous owners were identified as Lewis Morris [1752-1824] and his son Lewis Morris [1785-1863], father of Henry Manigault Morris. For the genealogy of this family see W. W. Spooner, "The Morris Family of Morrisania," American Historical Magazine I, nos. 1-5 (1906), 136-142, 321-323, 427-428. Lewis Morris provided the names of past owners to dealer William Macbeth in 1922 in letters and in a handwritten document; see the Correspondence Files, Macbeth Gallery Papers, AAA. A family tree with owners' names and dates was prepared by the Macbeth Gallery to clarify the provenance. The sale is documented by a receipt signed for Lewis Morris by his agent Margaret Stiles, 26 May 1922; Correspondence files, Macbeth Gallery Papers, AAA. Stock disposition card, Macbeth Gallery Papers, AAA. Art House, Inc., was the dealership that Thomas B. Clarke established. The name of the seller and the date of purchase, 4 December 1923, are recorded in a copy of Portraits by Early American Artists of the Seventeenth, Eighteenth and Nineteenth Centuries Collected by Thomas B. Clarke, Exh. cat., Philadelphia Museum of Art, 1928, annotated with information from files of M. Knoedler & Co., NY (copy in NGA curatorial records and in NGA library).. The date is the same as the purchase of the painting from Macbeth by Art House, Inc., showing the close connection between the firm's holdings and Clarke's personal collection. Exhibition of the Earliest Known Portraits of Americans by Painters of the Seventeenth, Eighteenth and Nineteenth Centuries, The Union League Club, New York, March 1924, no. 20, as Lewis Morris. 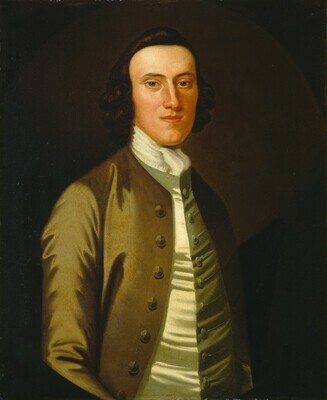 Portraits by Early American Artists of the Seventeenth, Eighteenth and Nineteenth Centuries, Collected by Thomas B. Clarke, Philadelphia Museum of Art, 1928-1931, unnumbered and unpaginated catalogue, as Lewis Morris. The World of Franklin and Jefferson, traveling exhibition circulated by the American Revolution Bicentennial Administration, 6 venues (Paris, Warsaw, London, New York, Chicago, Los Angeles), 1975-1977, not included in cat. Loan for display with permanent collection, M.H. de Young Memorial Museum, San Francisco, 1977-1979. Bolton, Robert. A History of the Several Towns, Manors, and Patents of the County of Westchester from its first Settlement to the Present Time. 2 vols. New York, 1881: 2:484. Sherman, Frederic Fairchild. "John Wollaston's Portrait of Mary Walton Morris." Art in America 11, no. 6 (October 1923): 333-334. Portraits by Early American Artists of the Seventeenth, Eighteenth and Nineteenth Centuries, Collected by Thomas B. Clarke. Exh. cat. Philadelphia Museum of Art, 1928, unnumbered, as Lewis Morris. Bolton, Theodore, and Harry Lorin Binsse. "Wollaston, An Early American Portrait Manufacturer" The Antiquarian 16 (June 1931): 52. American Paintings and Sculpture: An Illustrated Catalogue. National Gallery of Art, Washington, 1970: 124, repro., as Lewis Morris (?). American Paintings: An Illustrated Catalogue. National Gallery of Art, Washington, 1980: 261, repro., as Lewis Morris (?). American Paintings: An Illustrated Catalogue. National Gallery of Art, Washington, 1992: 383, repro., as Lewis Morris (?). Miles, Ellen G. American Paintings of the Eighteenth Century. The Collections of the National Gallery of Art Systematic Catalogue. Washington, D.C., 1995: 355-358, repro. 357.